Chicken, prawn and noodle laksa is a Malay-inspired recipe which is made even easier by the use of a carton of Thai chicken soup. 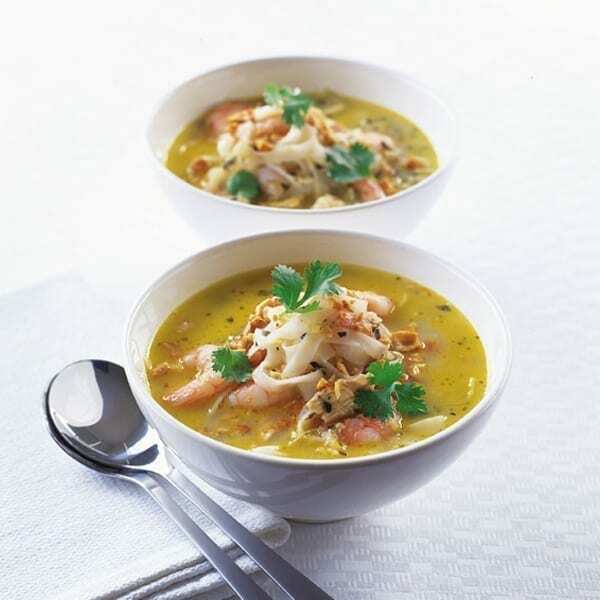 This laksa is a pretty robust sort of soup which makes an unusual and satisfying main course. Vegetarian? Try our butternut laksa recipe. Pour carton of Thai chicken soup into a large saucepan. Add a splash of water to the carton and swish out the remainder into the pan. Put over a medium heat until just boiling, then reduce to a simmer. Add rice noodles and cook for 2 minutes, stirring occasionally, until the noodles have started to soften. Stir in prawns and add a squeeze of lime juice to taste. Cook for 1-2 minutes to heat through, then season to taste. Divide between deep bowls and sprinkle with peanuts and fresh coriander leaves to serve.